to reach out eagerly and without fear for richer and newer experience." HOW DO I KNOW IF LIVING IN AN RV IS FOR ME? You probably won't know until you try. Sorry if that's a little vague! You'll hear me say it again in response to some other very reasonable questions, too. You're already ahead of the game if you've done some RVing for at least a couple weeks at a time and enjoyed it so much that you were reluctant to return home. That's a good sign that the RV life might be for you. It's a far cry from living in an RV full time, however. And if you're a total newbie to traveling in an RV, you've got lots of homework to do unless you're an impulsive type who just plunges into new things with little preparation. Sometimes that works out well, sometimes not. it was attractive, but white leather furniture isn't practical for active folks like us. The good news is that you can start gradually with a rented or used RV and go out for longer and longer trips to see if you enjoy traveling as much as you think you will. In most cases there will not be a traumatic event like a house destroyed by fire or a tornado that will force you to make a rapid decision. I've heard of situations like that. 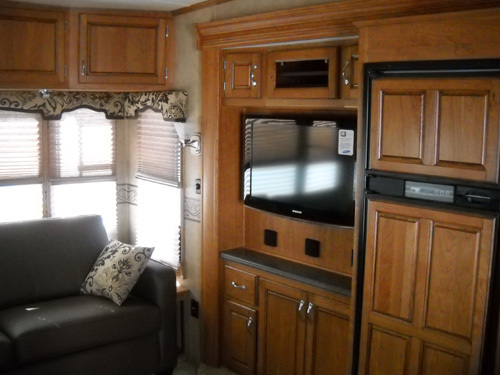 This is a lifestyle you can research from many different perspectives, thanks to a plethora of written and electronic resources -- RV websites, blogs, books, articles, newsletters, and DVDs covering every nuance of the lifestyle you can imagine. Just look at the number of sites that come up when you do an internet search for any RV topic you can think of. I'll post a few links in the last entry in this series, sites that I've found helpful or interesting. There are gazillions more. You can even find pop psychology "personality tests" that purport to tell you if you fit the profile of a happy full-timer. 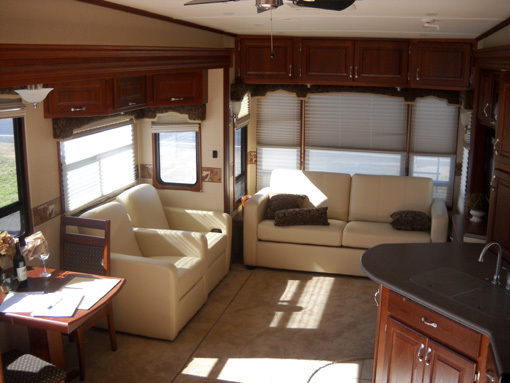 Professional interior view of another Cameo 5th-wheel model used in Carriage, Inc. advertising. I think the message to wannabes is that those are two happy full-timers on the TV screen. You can spend so much time reading available materials that you'll either get totally confused by all the conflicting information and perspectives -- or you'll waste time when you really should be experiencing it for yourself! Even if you fit the "profile" of people who enjoy traveling in their RVing all the time, you simply aren't gonna know for sure until you try it. Adaptability/flexibility -- this is the biggie. If you want a neat, orderly life, you're not likely to find it traveling around the country all the time by any mode of transportation, especially an RV! Murphy's Law rules. There are so many things that can and will go wrong when you're traveling and living in an RV that you'd better be able to go with the flow. That means 1) accepting whatever goes wrong with the weather, traffic, your RV, your tow or towed vehicle, your perfect plans, your health, etc., 2) finding solutions as quickly as possible, 3) implementing them as seamlessly as possible, and 4) moving on with the least amount of whining and complaining as possible. I'm convinced that adaptable people live happier lives in general than ones who are inflexible and have difficulty accepting change. Patience, a sense of humor, and a positive attitude will help you deal with those vicissitudes, too. Optimism and a sense of humor will enhance your mental and physical health. Folks who can laugh at their own foibles and silly mistakes, as well as life's absurdities, are more likely -- in my opinion -- to enjoy the RV lifestyle than those who are grumpy, pessimistic fun-sponges. The ability to live in close quarters with your travel companion, if you have one -- in most cases, this is a spouse you already know quite well. If you haven't lived for months at a time with your companion in a very small space like an RV, however, any differences in habits and personalities are probably going to be magnified. Respect, tolerance, compromise . . . I'll elaborate on this later. 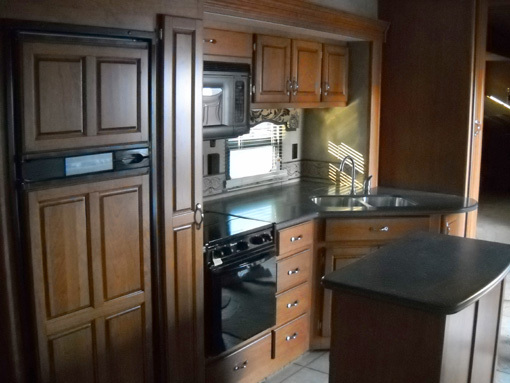 Our RV kitchen has enough room for two cooks. Being open to seeing and learning new things; having a sense of adventure -- what's the point of traveling around this magnificent country/continent of ours if you aren't curious and open-minded? Isn't that what travel is all about?? I pity folks who visit a new city or country and gripe because it "isn't like home," or people who spend five minutes on the south rim of the Grand Canyon and don't bother to explore that national treasure even a little bit more. What a waste of opportunity. One of the biggest reasons I love our lifestyle is the chance to discover new places, learn new things, experience new cultures, and meet new people. Otherwise, I may as well stay in one place all the time. Experiencing something yourself is so much different than vicariously reading about it. An ability to live with less stuff -- simple laws of physics say you can't cart everything you own around with you in an RV unless you've already disposed of just about everything! (That's very rare.) In fact, don't even fill the closets, cupboards, drawers, and other storage spaces in your RV with as much as they will hold or you'll probably be traveling in an unsafe manner because of too much weight. Consider this limitation to be liberating, not some sort of deprivation. You'll have less stuff to clean or worry about! This is our floor plan. It sure is easier to keep clean than that house we'd like to sell! The ability to amuse/entertain yourself when you're alone, bored, or can't get TV or internet connections and your NetFlix movie hasn't arrived yet . . . Some mechanical skills or, at minimum, basic knowledge of how to operate all the systems, gadgets, and gizmos in your RV. There are at least as many things that can go wrong with an RV and tow or towed vehicle as a "real" house. 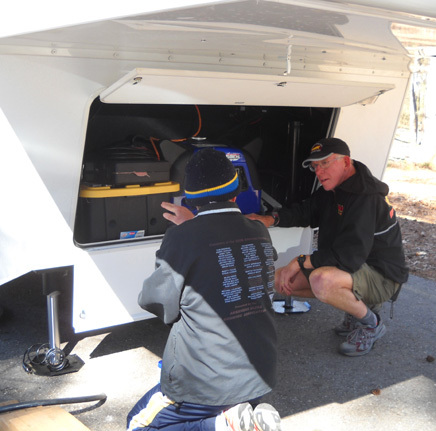 Dealers and previous owners of RVs don't always spend a lot of time showing you how everything works when you first take possession of your new home on wheels. Even though a young lady spent well over an hour showing us how to operate almost everything in our camper on the day we drove it off the lot, it was 'way too much information to absorb in one session. We read through all of our operating manuals/warranties soon after buying the Cameo and continually refer to them when we need to. If something needs to be repaired that you can't fix, know the various manufacturers' warranty drills -- how long the malfunctioning part is warranted, how to make claims, where you have to take the rig for servicing so it will be covered, etc. Some things are warranted by the RV manufacturer, some by the individual companies that make the various systems. You're ten giant steps ahead if you or your traveling companion is a handy person who can fix most anything that goes wrong. I'm glad I'm married to one of those! off-grid power system (solar, generator, charge controller, etc.) on the Cameo last year. 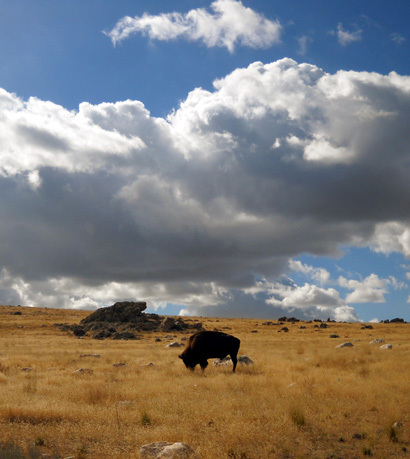 A love of the outdoors -- I suppose this isn't critical if you want to stay in urban areas and not venture out into the woods or desert, but to us, communing with Mother Nature is the best part of RVing! 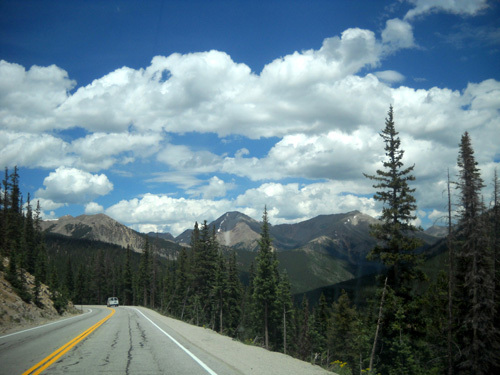 Whenever possible, our destination campgrounds are in or near scenic areas with mountains, forests, water features, and good trails. We prefer to stay in public (not private) campgrounds smack dab in the middle of the trees or desert. 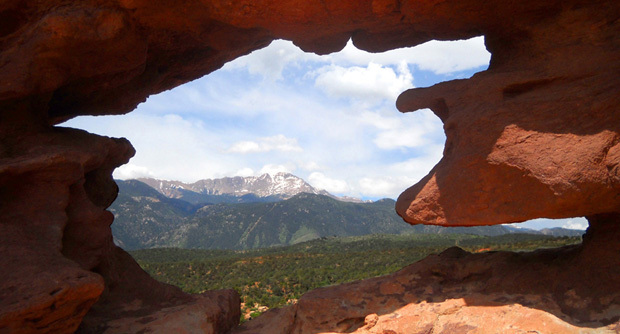 Local, state, and national parks or forests are our favorite destinations. WHAT ABOUT "LOVING TO MEET NEW PEOPLE?" You don't have to be a social butterfly to live a satisfying RV lifestyle. We know several individuals who are basically loners and they do just fine all by themselves most of the time. They have lots of interests and activities to keep them happy as they travel around the country. If they want to mingle, they know where to find like-minded people. At the other extreme are those gregarious folks who crave constant companionship and people-stimulation. For various reasons they don't want to be alone for any length of time. They don't just like to be with people who share the same hobbies and interests all the time -- they'll talk to anyone who will listen to them. They tend to enjoy organized activities at RV parks, they join RV clubs and attend rallies, and they like to caravan with other RVers to interesting destinations instead of traveling solo or with only their spouse/travel companion. 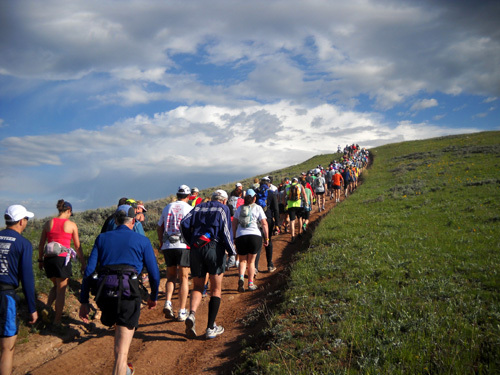 This is the most fun way for us to see old and new friends -- run and volunteer at ultras! Right now I'd put Jim and me more toward the "less social" end of that spectrum. We're not anti-social but we like our alone time. It wasn't always such. I had so much social contact my first 50 years -- the small town where I grew up (like a fishbowl! ), school and college, adult work environments, all the organizations to which I belonged -- that I've deliberately sought more time alone or with just Jim since I retired. Ditto for Jim. We can easily sit outside our camper in the evening without feeling the need to befriend all of our neighbors. I cherish the peace and quiet I find on a hike through the woods or just watching the sunshine bounce off little ripples of water moving across a lake. When I want more contact with people, I know where to find them. At this point Jim and I aren't interested in attending RV rallies or joining RV clubs or caravans. 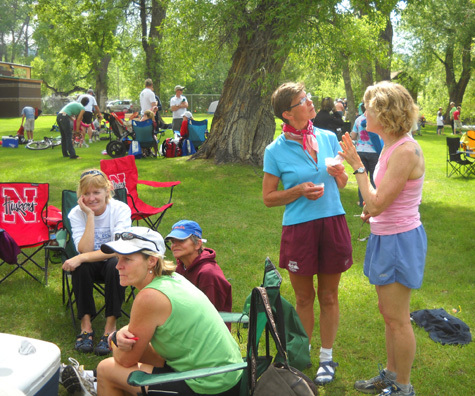 We do enjoy seeing our friends from far-flung places at ultra races around the country. When we don't visit in person, we keep in contact with our families and friends via the phone or e-mail. When we no longer have any interest in attending races, we'll find other activities we enjoy and nurture new friendships. Maybe we'll stay in one campground longer, get involved in some organized activities there, do more volunteering, and develop lasting friendships with other RVers. Maybe someday we'll want the companionship of other people in a caravan when we travel. Maybe we'll even take up bingo some day. Ha! That's not likely. Jim and I joke about how we'll act "when we're old." Bingo's not on our radar screen now, but who knows what we'll be interested in when we're in our 80s or 90s? RVers can choose places where they can find the solitude they need -- or all the social interaction they want. The RV lifestyle is what you make of it, just as any other lifestyle. 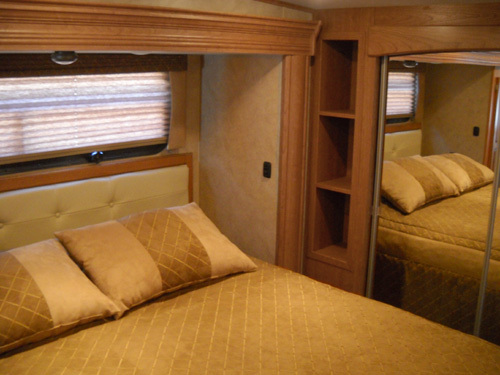 HOW CAN RVers LIVE IN SUCH CLOSE QUARTERS WITH ANOTHER PERSON ALL THE TIME? That's a significant factor in whether you and your spouse/travel companion will have fun with this kind of lifestyle. A lot depends on how well you know each other's strengths and weaknesses, how much you care for and genuinely respect each other, how you deal with differences that arise, and how many options you have for finding some time alone. Regardless of how long you've known or lived with this person in a stick house -- or even how many times you've taken short camping trips together -- if you haven't lived in such close proximity 24/7 for any significant length of time you aren't gonna know until you try it. I've already said that at least once about another question people have about the RV lifestyle and you'll hear (read) it again. There are just some things you can't answer for yourself before giving it a whirl. Jim and I have lived together for eleven years and been married for ten. In that time we've owned two different houses, each with enough space to be well out of sight and earshot of each other when we were doing different things or wanted to be alone. When we're at our house we have two vehicles we can drive to put even more space between ourselves. Or we can walk, run, or bike somewhere. I don't mean that we are frequently trying to be alone! Au contraire. I'm just emphasizing that when two people live in a stationary dwelling, they usually have several options for being alone. Not so in an RV. Even the largest RV seems tiny in comparison to a house or apartment. If it's big enough you might be able to go into the bedroom and close the door but you're still within a few feet of the other person. You're even closer in a smaller camper. Your options are more limited for quiet or alone time. You may not have a tow or towed vehicle to drive away in. You may not even be able to go outside for a solitary walk, run, or bike ride. If you're desperate to have some privacy, quiet, or time alone, what will you do? That's something to think about before embarking on a full-time RV lifestyle. I think this lifestyle has brought our relationship even closer together. We do joke, however, that the reason we have a rather large 5th-wheel is so we don't kill each other! Respect for each other's differences, a good measure of tolerance, and the art of compromise can go a long way to keep peace between two people in an RV. Adaptation and diplomatic escape are also helpful. I'll give you an example of two problems Jim and I have when we're living in the Cameo and how we either compromise or adapt to them. None of our solutions are perfect but they're the best we've come up with so far. 1) At the house, Jim has more things to do to keep busy and he doesn't watch TV much. In the camper, he gets bored more easily, especially after dark, and he likes to relax by watching history, nature, science, crime, comedy, or news analysis shows on TV. That's one of our basic differences: I could pretty much do without a TV altogether, especially when I can get all the news, information, and entertainment I want to read on the internet. I've gradually gotten to the point where I don't watch any TV series at all. National and local news, some scientific, travel, or nature programs on PBS, and "Jeopardy" are about the only shows I watch nowadays -- and then only if I'm not busy doing something else that interests me more. In the evening I'd rather be reading or writing on the computer than listening to the TV. I can focus best when it's quiet. Any noise distracts me. I've always been that way, even as a kid, not just as I get older. Jim, on the other hand, likes continual background music or talk even if he isn't listening to the content of what's on the radio or TV. The flat-screen TV in our Cameo is the first one we've ever had. Unfortunately, in the camper I can't escape to my study at the far end of the house and get away from the noise. The TV and radio in the Cameo are less than ten feet behind me when I'm sitting at my desk. If I'm unable to tune out the talk (it's hard not to hear bits and pieces of the shows Jim's watching), I sometimes put in earplugs to muffle the sound. If I'm really distracted and can't concentrate, I'll take a walk outside for a while. 2) As Jim and I get older we are both having more trouble sleeping. Jim sometimes lies awake for several hours during the middle of the night. This has become especially problematic since his meniscus injury in November and subsequent surgery. His knee is fine when he's moving around or even running, but it hurts when he sits too long or is lying in bed. The pain meds he's tried haven't resolved the issue so far. He's working on that, and other solutions. When we're at our house and one of us has trouble sleeping or wants to get up early, it's easy to get up quietly and go to the other end of our L-shaped floor plan to the main living area where the TV, Jim's laptop, our comfy recliners, and a sofa are located. The person who's up can turn on a light, get something to eat, watch TV, or get online without bothering the one who's still asleep in bed. Now try doing that in an RV! We haven't come up with a good solution for this one, even with the bedroom door closed. It works better when Jim's the one who gets up for a while because I usually wear earplugs and don't hear him. I'm more likely to feel the camper rocking slightly as he moves around downstairs (the living area is three steps down from the bedroom in our 5th-wheel). It's more of a problem when I'm the one who gets up. Jim usually doesn't wear earplugs but he probably will try that next. He sometimes hears me or feels the camper rock a bit when I get up in the middle of the night to go to the bathroom. It's worse when I get up first in the morning. I usually stay asleep most of the night but wake up earlier than Jim (After being awake in the middle of the night, he tends to sleep more soundly from about 5-8 AM). I'd like to get up right away but I often lie in bed, wide awake, for an hour or longer until I just can't stand it any more. That usually wakes Jim up, too, even though I try very hard to go out of the bedroom, close the door, get dressed downstairs, make my coffee, and take Cody outside as quietly as possible. These are just two examples of things that can cause complications or friction when you live with another person in a camper versus a whole house. Imagine the difficulties if you are traveling with someone who has totally different ideas of where to go and what to do! Whatever the problem or difference of opinion, you sometimes have to compromise, sacrifice, or come up with ways to make it work well for both people or your days on the road might come to a screeching halt. SHOULD I TAKE MY PET WITH ME? Maybe. Maybe not. You'll be able to answer this with more certainty if you've done any shorter RV trips with your pet already. If you have one or two well-mannered, leash-trained dogs or cats that don't get motion sickness and are beloved members of your family, I'd say take 'em. 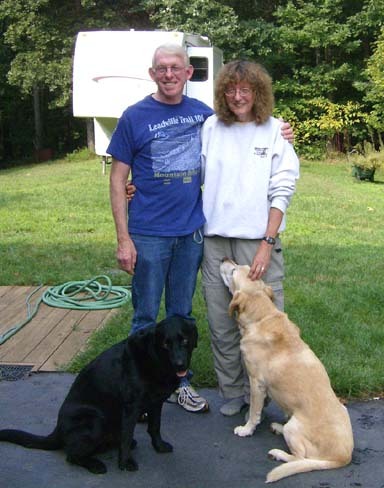 Many extended-travel and full-time RVers take their pets with them. They wouldn't consider anything else. At least try it before deciding to leave your pet with someone else for a long time or giving it away. That can be an unnecessary trauma for your pet and you. 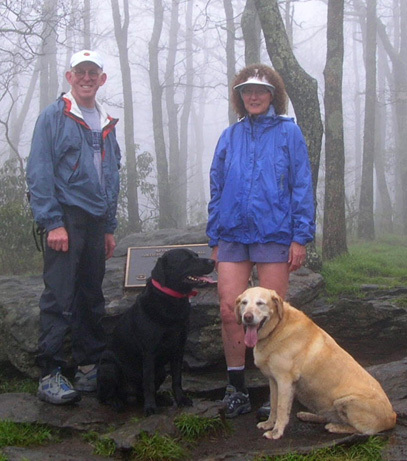 We never, ever considered leaving our two rather large Labrador retrievers behind when we began traveling more extensively seven years ago. In fact, if you have a Lab or Golden retriever, just try to leave it at home! Ours go anywhere with us with great enthusiasm, even to the vet, just to get to ride and be with us. 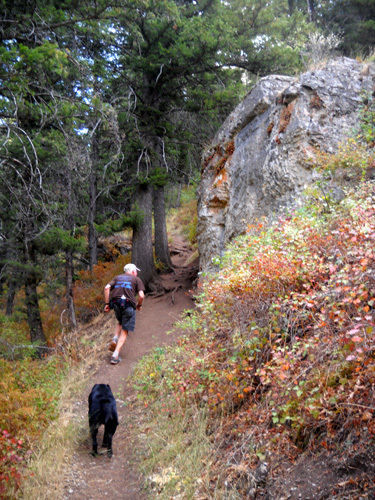 It's a grand adventure to them, almost as much fun to them as trail running and swimming in lakes! 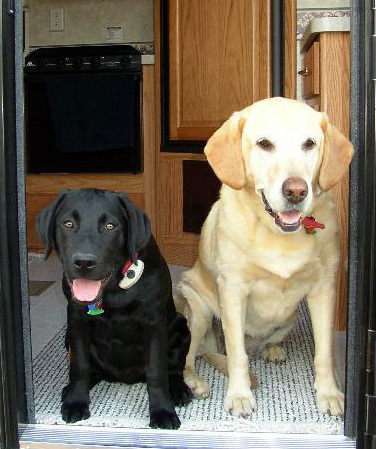 Tater and Cody are one reason we got a 34-foot 5th-wheel back then; our old 24-foot camper was too cramped with both dogs. Cody (still a pup) and Tater sit inside the front door of the HitchHiker. We did have some concerns during Tater's last year of life when she began having mobility problems from arthritis and we had to assist her into the truck and camper. I've seen articles about people installing lifts in their RV or truck for dogs that can no longer climb stairs but we didn't get to that point. Tater died two summers ago when we stayed at our house in Roanoke because of the high gas and diesel prices. If we had traveled that summer we would have taken her with us and sought veterinary treatment on the road when she got sick. Not only can pets provide companionship on the road, the right dog can also make traveling safer, especially for women who travel alone. If you take your pet with you be sure it is up to date on its shots. On our four- to five-month trips we take enough of Cody's heartworm pills and flea preventative to last the duration, then re-supply when we're back in Roanoke. Be sure to have your pet's veterinary records with you. 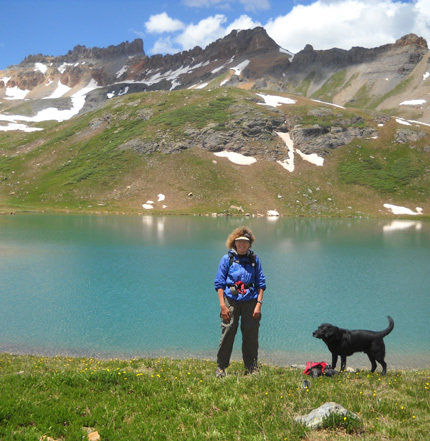 Some private campgrounds require proof of rabies, kennel cough, and other shots. We've never run into that in public campgrounds, however. to swim in. 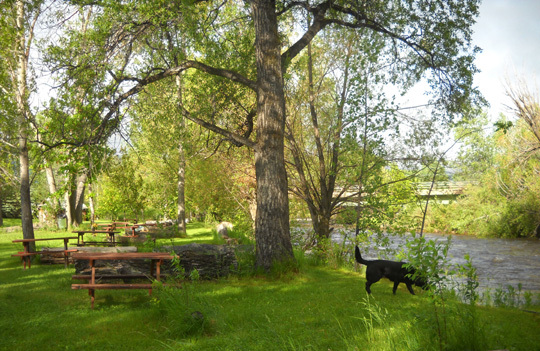 This is our favorite private campground for many reasons, including being dog-friendly. Be aware that some campgrounds -- mostly private ones -- also have restrictions on the size, breed, and/or number of dogs you're allowed to have at your site. In some places you might be restricted to one or two 20-pound dogs, e.g., and breeds like pit bulls, chows, and rottweilers may be prohibited. Some places even charge an extra fee for pets, similar to motels. Always ask about pet policies when you're making campground inquiries or reservations. When deciding about taking a pet with you for extended periods on the road keep in mind that no one enjoys camping next to a yappy dog that barks incessantly or a cat that likes to wander over to their RV to pee on the running shoes they left next to the steps to dry. 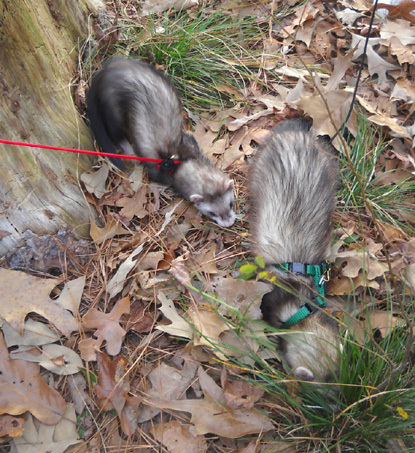 We had to hold the little guys and find out what it's like to take two ferrets camping! They remain in their cage inside but get to go outside for fresh air and exercise on their leashes every day. 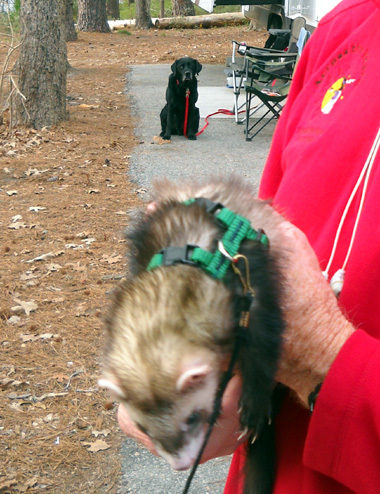 Cody could hardly contain himself while the ferrets were moving around on the ground and when we were holding them but he sat nicely in the background and didn't bark or strain at his cord (below). 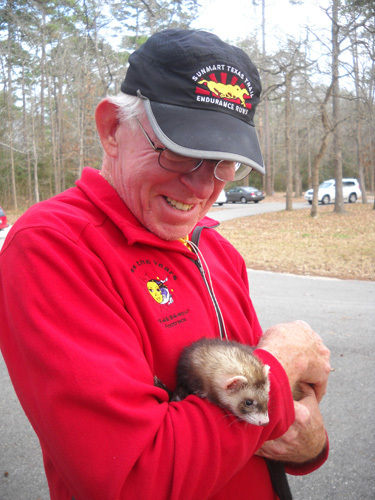 He got to touch noses gently with one of the ferrets to satisfy his curiosity. I often tell Jim, "Cody needs a puppy." Now I joke, "Cody needs a ferret." Just kidding about that one. He really does need another dog for companionship, though. And we have plenty of room for another one in the Cameo . . . I've read about other kinds of pets that RVers take on the road with them but we haven't met anyone yet with a bird, guinea pig, hamster, snake, turtle, rabbit, monkey, pet pig, or tank of fish. I suppose any of those could go along for the ride. If you've got a whole menagerie of critters, however, or large ones like horses, you may not be ready quite yet for full-time RVing.